Find what you’re looking for faster with Sonar X3’s new Browser. When Cakewalk first released the X series of Sonar, they also added a Browser window. Those raised on earlier versions of Sonar likely had their own way of getting where they needed to go, and frankly, the Browser doesn’t really do anything you couldn’t do in previous versions. However, what the Browser does do is let you access a variety of important files and plug-ins faster and far more efficiently. What’s more, the Browser adds a strong drag-and-drop element to your workflow. Improvements have also been made to the Browser through the Sonar X2 and X3 updates, so if you haven’t been taking advantage of everything the Browser offers, this is a good time to jump on board. Choosing the Folders view gives the Browser Explorer-like capabilities. If you use loops, one-shots, or any external audio files, the Media tab is invaluable. The drop-down menu there sets up the basics, including various views, a bus for previewing audio, and a synth for previewing MIDI files. With Views, choosing Folders turns the Browser window into a ‘Sonarised’ version of Windows Explorer, which makes it easy to browse through CD-ROMs, drives dedicated to samples, and the like. If you choose Views/Details, the right pane will show the filename along with the size, type (for example, WAV, REX, AIFF), and when it was last modified. 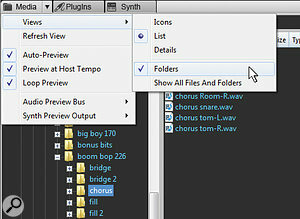 Furthermore, selecting Folders shows only files that can be opened in Sonar, which makes finding relevant files easier — but if needed you can see files of any type by selecting Show All Files And Folders. It’s also important to realise that the Media browser is bi-directional: if you create a clip or loop in the Track View, you can drag it into an appropriate Browser location. However, there are some limitations: you can’t create new folders within the browser (although you can rename and delete existing folders). Also, if the right pane shows folders, search doesn’t look within folders — the right pane needs to show folder contents. Search’s main use is if you have a folder with lots of files, and want to filter files with specific search terms. The drop-down menu to the right of the Content box (the box below the Media Browser tab) has powers of its own. It organises the content provided with Sonar, so if you want to browse (for example) the included Step Sequencer or MIDI Groove Clip patterns, select what you want from the drop-down menu. Sonar X3 has added the ability to browse the project audio folder as well, so you can see (and audition) all the files used in the current project. Note that you can even browse Track Icons and drag them into a project (although unfortunately you can’t actually see the track icon’s picture), and also drag in Track Templates. If you’re not yet a Track Template fan, they’re a huge time-saver — especially because you can save something like a virtual drum instrument with multiple outputs, various effects, sends, track icons and track parameters, for example. However, being able to drag a template directly into a project saves just that much more time. There are two other interesting features. If you’ve chosen the Folders view, then clicking on a particular type of content highlights its location in the left pane’s file tree (for example, you’ll see that PTN MIDI Patterns are located in the Sonar X3 folder, but the RXP REX Loops are located in the Contents folder inside the RXP folder under VstPlugins). The second is that you can create and delete locations. 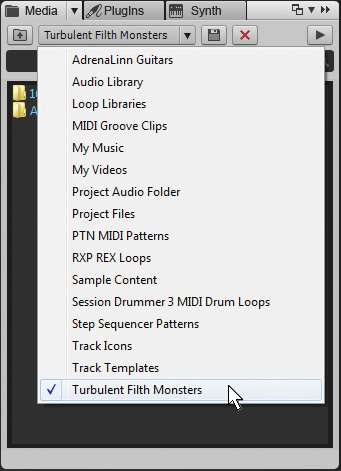 For example, if you have a folder called Loop Libraries that you access a lot, select it in the left pane, open it to reveal the files (the folder’s name will show in the Content box), then click the Save (Disk) button to the right of The folders AdrenaLinn Guitars, Loop Libraries and Turbulent Filth Monsters have been added to the default roster of content locations. the Content box. This location will now join the other locations in the drop-down menu. You can also double-click in the Content box to rename a location. Granted, you can still drag and drop audio into Sonar from the desktop — but once you get used to using the Browser, you’ll find it’s a far more efficient process. This is pretty straightforward: click on a file, then click the browser’s play button to audition it. In the Media tab drop-down menu, you can choose Auto Preview (click on a file and it plays automatically), Loop Preview (if disabled, a loop will play as a one-shot) and Preview at Host Tempo. 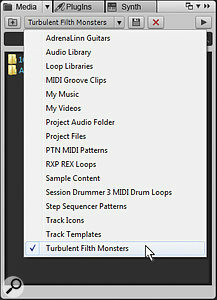 That last one is particularly useful when you want to hear if a loop will sound acceptable if stretched beyond its comfort zone, and with groove clips that contain pitch metadata, ticking this box will also transpose the loop to the default project pitch selected under Project/Set Default Groove Clip Pitch. To give an example of how this is useful, my ‘AdrenaLinn Guitars’ sample CD does two versions of each loop — one in E and one in Bb. Previewing the transposed sound makes it easy to hear which will sound better in a given project before dragging it in. The Plug-ins Browser has tabs for Audio FX, MIDI FX, Instruments and ReWire. You can drag plug-ins into the FX Bin, but there are a few twists. If you drag an audio effect anywhere in the track header, into an empty space in a track, or into a console channel, it will go in the FX Bin. Drag in another effect, and it will insert after the first effect you inserted. However, if you drag it into the FX Bin itself, you can position it anywhere in relation to any effects that might already be there. Note that as soon as you drag in the effect, the UI opens: Sonar assumes that if you’re dragging an effect into a track, you’ll probably want to edit it too. Curious if a plug-in is 64-bit or not, and whether you have the latest version? Click on the name, and you'll see pertinent information in a strip at the bottom of the browser. If you drag a plug-in over a clip, this opens up the Clip FX Bin and the effect becomes a clip effect rather than being inserted into the track’s FX Bin. If you drag over the clip and release the mouse, the effect will insert as the last effect in the Bin, but if you drag it over the Bin, you can insert it anywhere into an existing chain of effects.Effects are categorised in three folders: VST 3, VST 2, and DirectX. However, this is also where you can drag effects chains (from their own folder) into a track, as well as an External Insert plug-in, which isn’t really a conventional plug-in but more of a routing option for using external hardware devices with Sonar. What’s not as obvious is when you open up a VST 2 or 3 folder and click on a plug-in name, an information strip in the bottom of the browser shows details about the plug-in such as manufacturer, version number, type, whether it’s 32- or 64-bit, number of ins and outs, and if it’s double precision. 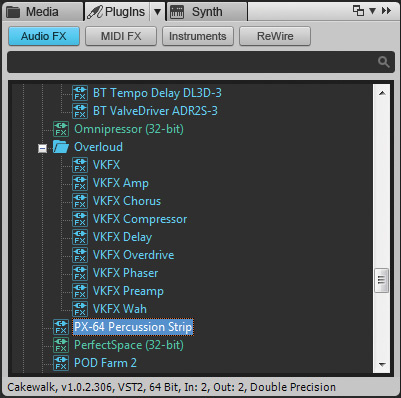 Not all plug-ins show all of these details, however, and DirectX plug-ins show only ‘DirectX’ when clicked.MIDI effects have the same basic protocol as audio clips in terms of being dragged into tracks, console channels or clips. The only significant difference is that, when you drag a MIDI effect into a clip, its FX Bin doesn’t open automatically. As a result, if you want to shift the order of MIDI effects,you’ll need to click on the MIDI clip’s FX Bin to open it. Incidentally, if you’re not aware of all the cool tricks you can do with MIDI effects, the Sound On Sound web site has two previous columns on the subject: www.soundonsound.com/sos/oct03/articles/sonarnotes.htm, which explains what MIDI plug-ins are and how they work, and www.soundonsound.com/sos/jul07/articles/sonarworkshop_0707.htm, which concentrates on using MIDI plug-ins for ‘automatic error correction’. Instruments work as expected if you drag them into a blank area in the Track View: the Insert Soft Synth Options window opens, where you can set up MIDI source, outputs, whether you want a track folder, and so on. Drag an instrument into a console channel, however, and the instrument loads into the FX Bin. If you want to use this as a conventional synth, then you need to create a MIDI track and set its output as the synth. It’s not a huge deal, but it takes fewer steps when you load the instrument into the Track View. The final plug-in tab is ReWire. If you remember the early days of ReWire when things would blow up if you didn’t open programs in the right order, this is a major improvement. You want to ReWire Reason into Sonar? Drag Reason into the track view, and... Done! The remaining browser element is the Synth Rack, which is quite different conceptually from browsing so we’ll save that for another time. But let’s sign off with a tip: If you delete a synth’s tracks in the Track View, that won’t delete the associated synth from the Synth Rack because you wouldn’t want that to happen if you were using a multi-timbral synth and other MIDI tracks were still feeding it. However, if you delete the synth from the Synth Rack itself, you’ll be given the option to delete all tracks associated with it.